Justin Smith views warnings of an imminent economic crisis from billionaire investors. AND the so-called Green New Deal may make the predictions even worse. The United States’ economy has surpassed all normal ebbs and flows, corrections, by approximately five years, since on average in each past cycle it rose for 56 months before collapsing. We’re about five years past that point and our economy is only now “cooling”. We’re just about due for another economic recession, if not a collapse that makes 2008 look small. We’re at the end of the line. The U.S. spends almost a third of its revenue on interest payments alone, and it doesn’t seem like it can afford to pay much more. In the short decade since 2008, the national debt, ever on the rise, has jumped from $10.6 trillion to $22 trillion. It also comes with a deficit that’s currently over $1 trillion currently. The interest payments alone may be forming a “black hole” from which the U.S. may never escape. And now we see twenty-nine year old Alexandria Ocasio-Cortez, a product of the Puerto Rican Enlightenment and a Bronx resident, and other red, radical socialists like her in the House of Representatives, promising Pie-In-The-Sky Utopia for everyone. This makes her a danger to herself, her constituents and the nation, since she believes there isn’t any problem that a government program cannot solve, and she is already advocating for Medicare for all, a job guarantee, free college tuition, a green infrastructure program, and a squeeze the rich tax plan (70% for those making over $10 million). Most political pundits say, “It will never pass … it’s crazy … it will harm the economy.” But, crazy plans that hurt the economy just might stand a chance at passing, since just over half the population in its entirety, and 51% of all Millennials, now have an acceptable view of socialism, some even embracing communism. When existing laws of the land cause bankruptcy and chaos, people seem to look to legislate even more absurd laws, which is precisely how the first New Deal was pushed through Congress, during the panic and despair of the 1932 elections. And the New Deal gave President Franklin D. Roosevelt carte blanche to enact a series of costly programs. A good guess is that the next economic crisis will be severe and long-lasting, too, as stocks fall hard and the economy goes into a deep recession. “How did we get here”, one young lady recently asked me. Short answer: America has been guided to this point, by the consequences of the Federal Reserve Act, centralized banking, regulations, currency manipulation, devaluing the U.S. dollar, socialist initiatives in Congress to fast-track globalism, unfunded debt, monetized debt and acts of anti-American national sovereignty on both sides of the aisle who are intent on tearing apart the Founders’ vision and U.S. sovereignty, in order to pave the way for the globalists and their vision of a “new world order”. Even ignoring economic history, there are signs everywhere, as nearly every major asset class around the world, from stocks and bonds to real estate, is selling at nearly an all-time high at prices that defy common sense. This suggests the possibility of a big recession and market correction just before the 2020 election, giving the socialists a much needed crisis that could catapult them into a majority in both houses of Congress. And that’s why we should all be praying that if any coming recession must come, let it hit soon, so it can be properly addressed before it becomes a major election issue. And Klarman isn’t the only billionaire expressing unease. At the World Economic Forum [Blog Editor: WEFORUM – Globalization 4.0; Breitbart-Pompeo-Nationalism; New American-Merkel-Communist China-Globalist Agenda; & TheGatewayPundit-Ted Malloch-Criticizing Davos] in Davos, Switzerland, Ray Dalio, founder of the world’s largest hedge fund, said that debt would be to blame for the next downturn, which he believes will be bigger than the Great Depression. 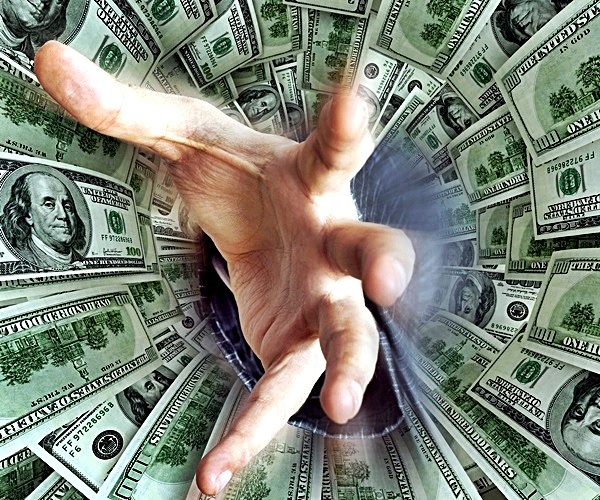 You might think the U.S. government would do everything to curb this problem, but Uncle Sam’s total debt is rapidly approaching $22 trillion, and according to the Congressional Budget Office’s latest ten-year projection, it will be more than $33 trillion by 2029, with $1 trillion annual deficits set to begin again and stay above that for as far as the fiscal eye can see. Although I’ve stated this twice before in this piece. let me reiterate — The U.S. spends almost a third of its revenue on interest payments alone. America and Her people cannot afford to pay much more. I was suspended from Google AdSense for not having enough original content. My blogs tend to be of an aggregate nature. So, aggregate commenting and/or sharing others’ content for a comment (especially on G+ communities and Facebook Groups), is not original enough? If the answer is no, I request a review. If the answer is yes, then the requirements are too stringent! AdSense was not a real big revenue source, yet the small remuneration produced a good feeling. I found it interesting my AdSense account was suspended just a mere $4.00 from a payout. At any rate, it would be a great sign if a couple of bucks (or Euros???) were kicked in every now and then to make up for the tiny lost feel-good pittance from AdSense. You could toss in those couple of bucks at my PayPal button at SlantRight 2.0 or the NCCR blog readers can CLICK HERE or the Ubiquitous8Thoughts readers can go to SlantRight 2.0 or click HERE for a PayPal monetary appreciation for any of my thoughts you agree with. That’s the pitch. All thanks to an AdSense suspension for the lame of excuse of not enough original content. I suspect the actual reason for a suspension is more about disagreeing with the content I post than a concern of a lack of original content. Essentially, this is a censorship effect through the purse. On Friday I shared that the editor of this blog – John R. Houk – had a financial need. I presented the need and then shared the business that my wife Diana Houk works as a salesperson from our home. That business is the selling of Kangen Water machines. I then proceeded the remarkable health benefits as sourced by the e-book “The Alkaline Body Balance” which is available for free from dianahouk.com by simply filling out first and last name, email and phone number (the latter is optional) near the top of the page. I encourage you to get that free e-book because I had only posted an excerpt telling the remarkable health benefits Kangen Water has for the human body. Below is a page from Diana’s website that tantalizes you with the business opportunity to join the Enagic Kangen Water sales team and work on your time according to your own goals from your home. Our family need is still for our family especially to provide a Christian education according to our Christian faith for the Grandchildren in which we are the guardians. By buying and/or selling a machine, it will not only benefit you personally, it will also be a part of our sales commission. By joining the sales team you also can make a commission commensurate with the work you put into the sales opportunities. This is neither a get rich scheme or nor a something for nothing scheme. “Work” is involved; however you set your hours and your own goals. If your goals are lofty your commission checks will be lofty. If your goals are connected to a valid extra income situation say for Christmas shopping, saving for a car, saving for a vacation or whatever goal in mind – you will receive from the effort you place according to those goals. BUT regardless of joining the sales team, utilizing the water will tremendously bless you and your family. Here is the business opportunity found on Diana’s website. I’m having a difficult time beginning this post. I am about to embark on a please support this blog because the Editor’s family has a financial need post. Left Wingers, Muslims and atheists are more than welcome to get on board, but I am not going to hold my breath. That group is more likely to ridicule or choke themselves in mocking laughter than supporting a Christian Right Conservative Counterjihad blogger as I definitely am. I blog primarily on three blogs. I consider SlantRight 2.0 my flagship blog. My next most popular blog is NeoConservative Christian Right (NCCR) on WordPress. The third blog is called Ubiquitous8Thoughts on a more obscure blog platform called Over-blog. All three blogs have roughly the same content; however posting on Over-blog tends to a bit more limitations than Blogger and WordPress. Only at SlantRight 2.0 do I have a donate button located near the top right underneath the picture of the Crusader Knight. The link I just placed under “donate button” on this post should also take you to my PayPal account if you are so inclined to express your generosity. The SlantRight 2.0 donate button on the blog will take you to a donate page managed by PayPal. The link I have provided on this post I have had hit and miss success with it working, but either way you do not need a PayPal account to use it. PayPal also utilizes a credit card/debit card format as well. Now that I have gotten the uncomfortable way to offer material support to this blogger allow me to share our family need. Our family actually has many financial obligations to meet; however I wish to emphasize one in particular. My wife and I are Grandparent/Guardians to three of our Grandchildren. My lovely wife and I married in 1990 in which both of us were previously married. Together we established a Brady Bunch situation: I had two kids and she had three. In 1990 those five children ranged from 7 years old at the youngest to 14 years old at the eldest. One of those children had four children of their own. I will not reveal which one of ours had the four for privacy reasons – theirs and ours. Diana and I are raising three of the four and those three are all boys. As Christian Right Conservatives we do not have a lot of confidence in the Public School system to use Christian morality and American patriotism to promote good values into our Grandchildren. We have been using the service of an AWESOME private Christian School called Victory Christian School located in Tulsa, OK. Victory is not one of those ritzy private schools. Victory has a good academic regimen at affordable prices. Plus all three Grandchildren are involved in the Victory football program. The two youngest in 1st and 2nd Grade football and the oldest in 7th Grade football. Below is an edited excerpt from the Kangen Water E-book that only gets to the tip of the iceberg for what Kangen Water can do for you and your family. Tomorrow I will share how you can turn a Kangen Water machine purchase into a money making enterprise as a home based business to supplement your income. Drinking water every day is crucial to maintaining optimal health. Since your body is about 60-70% water, your organs, 60-70% water, your organs blood, and other bodily systems require quality hydration in order to function at their peak performance. “Quality hydration” refers to water that is clean and free of pollutants or contaminants, contains minerals that support proper health, and is at a very positive pH level. Where on this Earth can you find such a high-quality water? Unfortunately, the world’s water is polluted with agricultural run- off, sewage, and other toxic agents that compromise our health. Even some bottled waters are no more than well-marketed tap water. And since their filtering processes eliminate all minerals – even the healthy ones – you will experience no additional benefits. Thankfully, Enagic® Kangen Water® is delicious, healthy water that filters all unwanted contaminants and pollutants found in your ordinary tap water, but the forward-thinking Enagic® technology ensures that the necessary minerals are left intact. Kangen Water® also has the ability to properly hydrate the body while creating a positive alkaline environment. What could be more important? After all, your body is water. 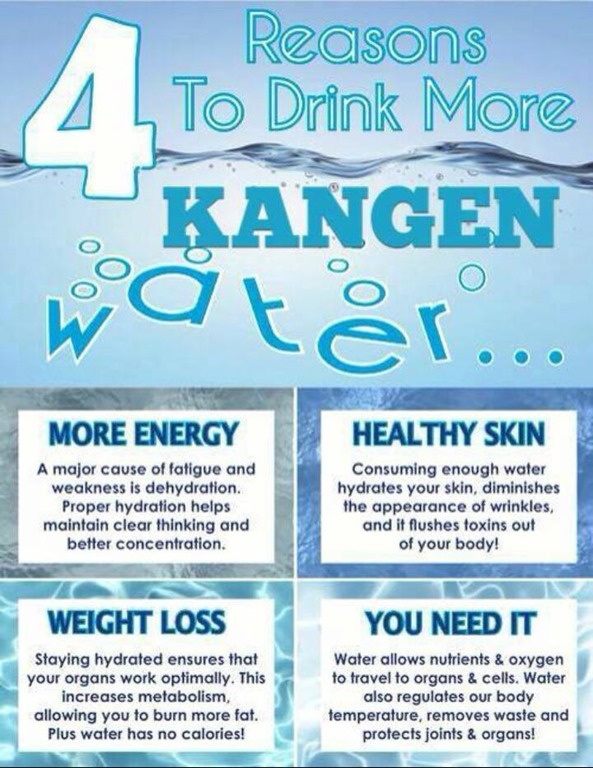 Kangen Water® can provide ultimate hydration for your whole body. The importance of hydration in a healthy body cannot be overstated. You need 8 cups of Kangen Water® a day to keep your body working properly with clean, filtered, alkaline water. Kangen Water® contains the minerals calcium, sodium, potassium, and magnesium. These minerals provide your body with the healthy boost you need to get through your day, and get optimal performance from your body. Unlike reverse osmosis, which is a water filtering process that strips away even helpful minerals, Enagic® water ionizing machines do NOT filter out these helpful minerals. Kangen Water® is slightly alkaline, with a pH level of 8.5 – 9.5. Enagic’s certified innovative technology uses the process of electrolysis to generate as much alkaline drinking water as you could possibly need (along with 4 other waters). Instead of nourishing your body with acidic and sugary beverages, you should be hydrating with clean, alkaline water every day. In a taste test of 10 Southern US municipal waters, expert judges made clear what most of us already knew: tap water just doesn’t taste good! Cities such as Houston, Atlanta, and Charlotte were criticized for offering tap water that tastes “like a chemistry lab,” “like having a gulp of swimming pool,” and “like a wet Band Aid”1. Bottled water has also been judged harshly for its unfavorable taste. But Kangen Water® drinkers enjoy a mild and pleasant taste, appearance, and smell. This delicious water will help you stay committed to your 8 cups of water a day! With its attractive and chic design, you can enjoy the convenience of generating any of the 5 healthy types of Enagic® water – including Kangen Water® – from the comforts of your own kitchen. The Enagic® water ionizing machines are easily connected to your kitchen faucet. No more storing pitchers of filtered water in the refrigerator, or buying bottled water every time you go out! Kangen Water® is a relief to virtually any budget. A family of four can consume 2 gallons of water daily for just $1.46 a year! Compared to other bottled waters and home delivery water services, you can save around $1000 – $7000 annually! This affordable, healthy water will keep your body and your pocketbook happy year after year. There’s no denying that Kangen Water ® is the right choice for you and your family! Now that you know the perks of drinking alkaline Kangen Water® every day for optimal hydration, let’s take a deeper look at what the popular alternative is in our culture today. Unfortunately, soft drinks contain more sugar, calories, and acidity than your body needs (or wants). American Heart Association suggests the maximum amount of daily sugar intake not exceed 25 grams for women, and 37.5 grams for men2. Also, anything lower than 7.0 pH is considered acidic, but most soft drinks are far below this number. Kangen Water ® is Right for You! Why choose a sugary drink, when Kangen Water® contains 0 grams of sugar? Why choose a high caloric drink, when Kangen Water® contains 0 calories? Why choose an acidic drink, when Kangen Water® is balanced with perfect alkalinity? Why choose anything but Kangen Water®? Most of these Newbill email relate to economic collapse and the Dollar collapse which will lead to some form of global and American chaos. One email pertains to a repugnant issue occurring in Syria still in a civil war. The issue is the occurrence of a disease that results by cannibalism. You won’t believe this, it will further the call for a new trade currency as this TPP trade Policy will further collapse nations sovereignty valued in dollars internationally. Obama-Backed Trans-Pacific Partnership Expands Corporate Lawsuits Against Nations for Lost Profits. The first part of this video talks about how the Surveillance Cabal by the NSA Spying is directly connected to the TPP International Trade Policy trying to rise up. Start this video at 29:00 to hear what the Trade Policy that will create the International Legal Cabal on U.S Constitutional rights. And this Cabal allows the Multinational Corps to act as Sovereign citizens and sue Nations for Financial Losses. This is a very bad disease …..Due to limited treatment will Obamacare lead to this disease spreading??? Its (sic) called Kuru, an extremely rare disease which virtually became extinct after extinguishing cannibalism in Papua New Guinea. Amazingly Kuru has now been found in 8 to 20 people, out of all places, in war-torn Syria, and the only way it could have come about, doctors confirmed, is through cannibalism and the consumption of human brain, as first reported by Arabian news source Zaman al-Wasal and substantiated by Orient News Television. Kuru is a very rare disease. It is caused by an infectious protein (prion) found in contaminated human brain tissue. Kuru is found among people from New Guinea who practiced a form of cannibalism in which they ate the brains of dead people as part of a funeral ritual. One of the infected men in the German hospital was confirmed to have eaten human flesh, and he eventually died. When the Turkish hospital was asked on the details of the cannibalism case, they refrained from saying anything. Moreover, the Free Syrian Army said they will be doing an investigation on the cannibalism case, and this sparks a hunch as to what their intentions are behind this. Overall, there are 8 to 20 cases of Kuru in Syria; Kuru strictly is caused by cannibalism, and cannibalism was involved from the report on what took place in the German hospital. It is quite possible that this is what commenced the infection, in that the jihadists began to eat the flesh of their enemies. We have written extensively on Islamic cannibalism, which can be found here, here, here, and here. Please donate to Rescue Christians and and save Christian lives. These links make the case that a Fed Bailout is coming and it will come through stock sales and the collapse of the Dow Jones. They are creating the crisis with Debt accumulation instead of supply expansion and accumulation!!!!!! The financial markets are focused on guessing when the Federal Reserve will begin to reduce its $85 billion a month in asset purchases. A move to buy fewer Treasurys and mortgage-backed securities — say, $70 billion to $75 billion a month as a first stage, instead of the current $85 billion a month — would lead, the market fears, to a rise in U.S. interest rates and a stronger dollar that would provoke a selloff in global markets. The consensus now says this tapering won’t begin until March 2014 at the soonest, although the Fed’s press release after the October meeting of its Open Market Committee led to a pickup among traders and investors in votes for January 2014. The Federal Reserve itself, however, has moved on in its worries and plans. While the timing of any taper remains an unsettled issue, planning at the Fed is now concentrating on the endgame. After building up its balance sheet to a record $3.84 trillion — including $2 trillion in Treasurys and $1.4 trillion in mortgage-backed securities — the big question, and the one with much more impact in the long-term on the U.S. and global economies and financial markets, is how does the Fed sell these assets so it can cut its balance sheet back to normal levels? The Federal Reserve must do more and do it fast before we fall into a 1990s-style Japanese deflation disaster, argues MSN Money columnist Anthony Mirhaydari in an article for MarketWatch. The Fed is continuing to purchase $85 billion of bonds a month in an effort to bolster the economy by keeping rates low. It’s not enough, warns Mirhaydari, a former research analyst. Mirhaydari recommends that the Fed inject funds directly into the economy by funding public-private infrastructure investment trusts or converting its Treasury holdings into equity-like assets, which would essentially erase some of the national debt. It could convert long-term bonds into zero-coupon perpetuity bonds. WASHINGTON — The Federal Reserve has taken unprecedented steps to stimulate the economic recovery from the Great Recession, but the tab has risen to such tremendous proportions — fast approaching $4 trillion — that some worry the central bank ultimately could require its own taxpayer rescue. The Fed’s total assets on its balance sheet have more than quadrupled to $3.8 trillion since 2008 amid a massive bond-buying effort. And there are few signs that the growth will stop any time soon. That could put the finances of the world’s most powerful central bank at risk if historically low interest rates were to rise sharply — something top Fed officials said they do not expect but that critics warn is very possible. It also could inhibit the ability of central bank officials to respond to future economic and financial crises. WASHINGTON — The Federal Housing Administration dramatically expanded its role after the subprime market collapsed, but at the expense of its own finances. 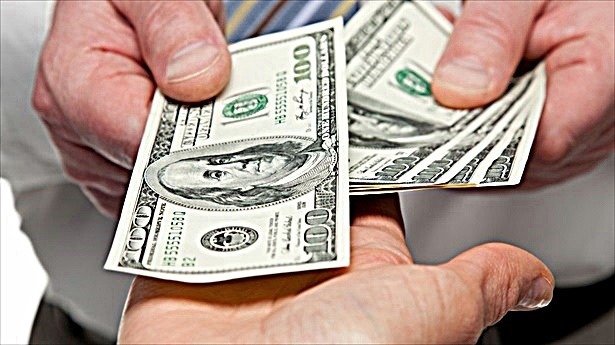 Now, the government agency will get a first-ever bailout of $1.7 billion. In a letter Friday to Congress, the agency’s head said it needed money to stabilize its long-term finances and cover potential losses on the huge volume of low-down-payment mortgages it insured from 2007 to 2009. It’s the first time the 79-year-old FHA — created during the Great Depression to keep home lending flowing — will require taxpayer funding. And it will get the money automatically. The FHA is financed by mortgage insurance premiums charged to homeowners and has been self-sustaining through its history. But it has the authority to draw funds from the Treasury without asking Congress. FHA Commissioner Carol Galante informed lawmakers the agency would need the money Monday, the last day of the fiscal year, to ensure it has sufficient reserves to cover anticipated losses on the loans it backs. A bailout has been expected since April, when the Obama administration’s proposed 2014 budget projected the FHA would need $943 million by Sept. 30. But the agency asked for nearly twice that much because of a recent decline in business, caused by rising mortgage interest rates, Galante said. Guest Post: Will The Fed Bailout China’s Financial System? The twenty-first-century economy has thus far been shaped by capital flows from China to the United States – a pattern that has suppressed global interest rates, helped to reflate the developed world’s leverage bubble, and, through its impact on the currency market, fueled China’s meteoric rise. But these were no ordinary capital flows. Rather than being driven by direct or portfolio investment, they came primarily from the People’s Bank of China (PBOC), as it amassed $3.5 trillion in foreign reserves – largely US Treasury securities. The fact that a single institution wields so much influence over global macroeconomic trends has caused considerable anxiety, with doomsayers predicting that doubts about US debt sustainability will force China to sell off its holdings of US debt. This would drive up interest rates in the US and, ultimately, could trigger the dollar’s collapse. To describe the symbiotic relationship between China’s export-led GDP growth and America’s excessive consumption, the economic historians Niall Ferguson and Moritz Schularick coined the term “Chimerica.” The invocation of the chimera of Greek mythology – a monstrous, fire-breathing amalgam of lion, goat, and dragon – makes the term all the more appropriate, given that Chimerica has generated massive and terrifying distortions in the global economy that cannot be corrected without serious consequences. With deals from London to Singapore, China is seeking a greater role for its yuan currency in global markets to challenge the hegemony of the almighty dollar. The most attention-grabbing reform planned for Shanghai’s new free trade zone is free convertibility of the yuan — also known as the renminbi, or “people’s money” — an unprecedented change which would allow greater use of the currency. But no timetable has been specified, and a true contest between Mao Zedong, Communist China’s founding father whose face is emblazoned on most yuan notes, and Benjamin Franklin on the $100 bill will be years in the making. For China — which has the world’s biggest foreign exchange reserves — the immediate appeal of a greater role for the yuan is lubricating trade flows and drawing foreign investment. “Policymakers have made new efforts to increase the attraction of the renminbi in global markets,” said Capital Economics analyst Wang Qinwei. He pointed to a deal with Britain in October allowing London-based institutions to invest directly in China — avoiding an expensive detour via Hong Kong — with an initial quota of 80 billion yuan ($12.9 billion). Evidence the yuan is becoming truly global can be found in Rongrong Huo’s passport, which shows the HSBC banker bouncing from Switzerland to South Africa fielding inquiries from a growing number of clients on how they can trade China’s currency. Three years after China allowed the yuan to start trading in Hong Kong’s offshore market, banks and investors around the world are positioning themselves to get involved in what Nomura Holdings Inc. calls the biggest revolution in the $5.3 trillion currency market since the creation of the euro in 1999. 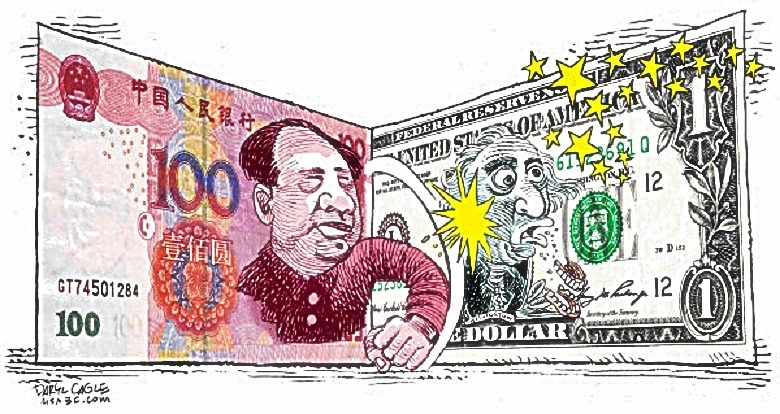 Daily yuan transactions surged to $120 billion in April from $34 billion in 2010, making it the ninth most-traded currency in the world, according to a September report by the Bank for International Settlements in Basel, Switzerland. Merk Investments LLC in Palo Alto, Calif. said it’s adding “as much as” it can of offshore yuan to its $450 million of funds. Union Bank NA, a unit of Bank of Tokyo- Mitsubishi UFJ Ltd., is pushing wealthy clients to diversify their savings into yuan deposits, while CME Group Inc., the largest futures exchange, began offering trading in offshore yuan derivatives in February. Much of these emails relate to the negative aspects of Obamacare. There is a bit of economics and depopulation agenda info as well. I want to show you how Obamacare is designed by one of its creators to NOT Promote Longer Life and the Principle architect even admits it by saying he does not believe in Personalized Healthcare!!!! You will see more people fall through the cracks when a One size fits all system is in place!!!! Scheiner said that the Obama administration neglected the advice of real physicians and instead decided to let political operatives craft Obama’s signature health care law. People like Obama’s former chief of staff Rahm Emanuel’s brother, Dr. Ezekiel Emanuel, were the kinds of medical people that the White House consulted. The intersection of technology, science, medicine and design has led to an explosion of apps for monitoring blood pressure, glucose levels and heart rate and measuring how well you sleep, whether you’re stressed or relaxed and whether you’re eating healthy. We have been able to harness the existing digital infrastructure to get personalized health data we did not have access to before. Combine wireless sensors with the study of genes, or genomics, imaging and a proliferation of health-focused social networks, and you have a convergence capable of bringing about the “creative destruction” of medicine. That’s the term Topol uses in his 2012 book, “The Creative Destruction of Medicine: How the Digital Revolution Will Create Better Health Care,” to refer to the transformation that accompanies radical innovation. But not everyone agrees with Topol. “Personalized medicine is a myth. It’s hyperbolic,” argued Dr. Ezekiel Emanuel, vice provost for global initiatives and chairman of the Department of Medical Ethics and Health Policy at the University of Pennsylvania. According to Emanuel, tailoring medical treatments to individual characteristics of each patient is both overly optimistic and cost-prohibitive. He likened it to buying a custom-made suit versus one off the rack. In addition to what he felt would be explosive costs, Emanuel also argued against personalized medicine by observing that behavioral and lifestyle changes like diet, smoking and exercise, which account for 40% to 60% of all disease, are far likelier to have an impact on longevity and health-care affordability than genetics and thus should be the center of focus. The bottom line is that when it comes to technology’s disruption of medicine, Topol believes the genie is already out of the bottle. Some of the best cancer centers are on this path. They are, however, treating a minority of the patients out there. There are a host of barriers to realizing the promise of personalized medicine — insurance reimbursement, privacy and regulatory issues, information and aggregation issues, among others — but perhaps none so pernicious as resistance. “The problem is that it takes physicians so long to accept a radical change. And the lag is unacceptable,” Topol said. Resist as some might, the power of one’s own data is the future of medicine. What will happen to Monetary Policy with Janet Yellen as Fed Chairperson? What will the effects on Monetary Policy be for Individual Prosperity with Janet Yellen [Link added by Blog Editor] as Federal Reserve Chairperson [with] her Husband’s views on worldwide Population growth? The President [Blog Editor: In this article the “President” is referring to the President of the Philippines.] and his advisors may completely disregard the prophecy made in the 1970s by the late Pope Paul VI that the widespread use of contraceptives would actually lead to all these moral and socio-economic evils. They, however, cannot ignore the scientific studies done by a Nobel laureate by the name of George Akerlof. They don’t have to take my word for it. Dr. Akerlof is easily accessible through Google. 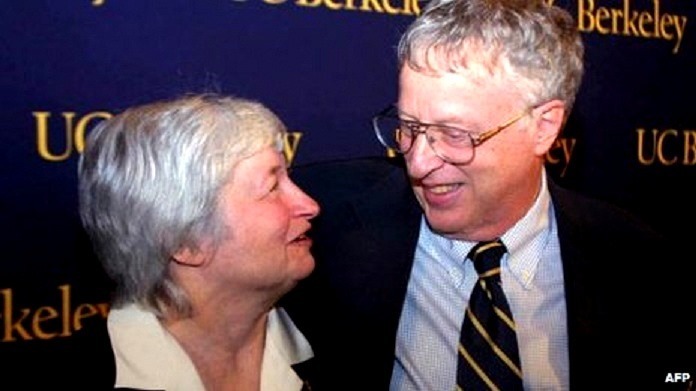 If the President himself takes time to google the name George Akerlof, he will find abundant materials that this economics professor has written about the high correlation between contraception and high rates of divorce, abortion, single mothers, etc. He will find out that Dr. Akerlof has no religious motivation whatsoever in presenting his data to the social scientists of the world. His conclusions are based completely on empirical observations. Actually, Dr. Akerlof has just demonstrated scientifically what everyday observation based on anecdotal evidence has already revealed to any objective student of human behavior. In countries where artificial contraceptives are as easily accessible as candies in the corner store, the rate of abortions has risen by leaps and bounds in the last twenty to thirty years, especially in North America and Europe. As regards divorce and out-of-wedlock births, Dr. Akerlof’s empirical conclusions have been confirmed by a recent study conducted by a multinational team of social scientists in a project entitled The Empty Cradle (also accessible through Google). President Obama is widely expected to announce this afternoon that he is nominating Fed governor Janet Yellen as the next chairman of the Federal Reserve, the most powerful institution in the world. I am sure Yellen’s nomination will receive the standard praiseworthy platitudes from a wide array of sycophants deeply embedded in the system. For those pleasantly hoodwinked by the charades masquerading as our current central bank policy, a Yellen-led Federal Reserve should look just divine. Meanwhile those watching closely would call her style of central banking little more than smoke and mirrors. Because there is no way to stop this Mobster of a Healthcare Policy from Collapsing the whole entire industry, I think the way forward with this healthcare debacle between is this …. Why not create a subsidy exchange for everyone to graduate into the exchanges rather than just some getting a subsidy and others not?? I think this would equalize the way the market and corporations ebb and flow into the relationship or partnership between public and private sector entities? Allowing the private sector some sort of way to offer subsides to cost share in the insurance premium markets and the ACA [Affordable Care Act] be a Guarantee of those subsidies much like say the SBA, HUD and Fanny and Freddy guarantees private sector funding should be considered so the Relationship between Public and Private sector markets can be streamlined and allow the system to work inspirationally. The Inspiration to help people will be better served I think and this will open the door to solving the Government shutdown because this offers the Republicans a method of policy that compliments conservative values and at the same time keeps the ACA helping with the failing system much like how a Governor on a Motor regulates its RPM so it doesn’t blow a Head Gasket when under extreme compression due to demand for power to pull a heavy load. And this is what you are trying to maintain right while we navigate the “Bumps and Hills” in the road to success???? I think you can be the one to offer a “National Subsidy Fix” to a Stalled out debate here that cannot be refused because of the way the private sector market can rally around the “Same Relationship like the other Government agencies work to guarantee funding flows”. To further build on this idea about how to equally subside the ACA healthcare exchanges, we should debate a “Rewards Based Subsidy Program” maybe???? I think tailoring something like the way Auto Insurance is considerate in that if a family is prudent in carefully creating a living practice that results in less accidents a reward of lower costs to premiums is the result means that this would be true in healthcare too. And that a doctor or medical providers cost structure would be based off an ACA annual report on medical usage. And that if the costs are rising that more educational values need to be implemented to drive societal understanding of its need to be better at performance of their healthcare. So [then] costs can be controlled and “Rewards” sustained in the Subsidy Exchanges which under the ACA Subsidy Exchanges associated with the ACA Healthcare exchanges would be then accessible to families that provide performance records that show less usage. And they be rewarded for this performance in less premium costs and that subsidy exchange then grows in value to afford a sector where costs are needing greater subsidy to offset their costs. This seems to be a Strategy I heard the insurance company named Tenet Healthcare this morning use in picking areas to invest in and associated with the ACA. But this needs to be a National strategy and so doing something with the subsidy policy needs to be the catalyst for bringing together supplement exchanges to equalize lower cash flow areas in the USA with higher. So that the Insurance Companies do not squeeze the higher cash flow areas for profits forcing more and more onto the Government exchanges . . .
“Cash Flow is the driving factor and of course you know this but the idea that this subsidy can be a market that the investing community can invest in to recycle unused capital and reallocate it based off an ebb and flow of healthcare performance” can be achieved here I think. But I think you have to create the rewards policy that will drive performance in individuals trying to be as healthy as possible. “Make it a Sport to be as healthy at living as Possible and I think we all win”!!!! Listen to this video at 11:00 forward, it has a part at 12:45 that will REALLY PISS YOU OFF!!!! I heard something in this video about healthcare costs associated with medicine costs being escalated at the 11:00 frame going forward too. If Obamacare ends up limiting treatment options then that will fit well with these concerns, right????? Doctors likely won’t list overpopulation as a cause of death in 2050, but research shows that it could contribute to several deadly problems, according to the Negative Population Growth organization (NPG). In 2011, the United Nations estimated the world population was 7 billion, and could reach 8 billion in 2023. After the largest population increase of any decade, America’s population sits at approximately 315 million and is projected to hit 363 million in 2030, according to the NPG. It’s PAST TIME to Bring Back the “BALANCE OF POWER IN THE U.S.A.”!!!!!!!!! 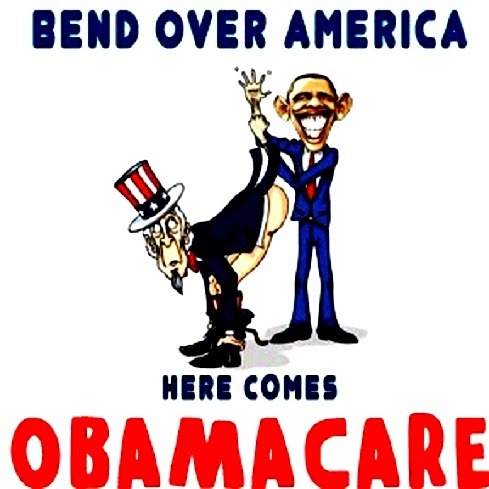 One of the main features of ObamaCare is the creation of a new federally-financed health care entitlement that will subsidize the insurance premiums for low and moderate income Americans, beginning in 2014. The amount of the subsidy is inversely related to family income and will be a administered by new state-based “exchanges” that will replace today’s small group and individual markets for health insurance. ObamaCare creates new entities in every state through which individuals buying insurance on their own must purchase their government-approved insurance. In addition, many small businesses employees will get their insurance through the exchanges as well because their employers will not offer coverage to their workers under ObamaCare’s rules for employer participation (see “Employer Mandate”). Households with incomes below 400 percent and above 133 percent of the federal poverty line (FPL) who are enrolled in insurance plans offered through the exchanges are eligible for premium assistance financed by the federal government (Medicaid will cover families with incomes below 133 percent of FPL). In 2010, the FPL is $22,050 for family of four. The new law establishes a sliding scale of assistance based on limitations on required family contributions to the cost of coverage. For instance, at 150 percent of FPL in 2014, ObamaCare limits the amount that such households must contribute toward their health insurance premium to 4 percent of their annual income. At 400 percent of the FPL, households must contribute 9.5 percent of their income toward insurance premiums. Whatever portion of the total health insurance premium for their coverage is not paid by these households is covered by the new federal premium assistance program. The Congressional Budget Office (CBO) has estimated that this new premium assistance program will cost $113 billion annually by 2019, with premium assistance going to an additional 19 million Americans (the Medicaid expansion will add 16 million new people to the program at a cost of $97 billion in 2017). Old Bill caved in to the Communist Chinese for the almighty buck. Guilt must have crept in due to criticism because Microsoft is going to make big buck foreign clients happy while brown nosing the Civil Rights activists of Free Speech. 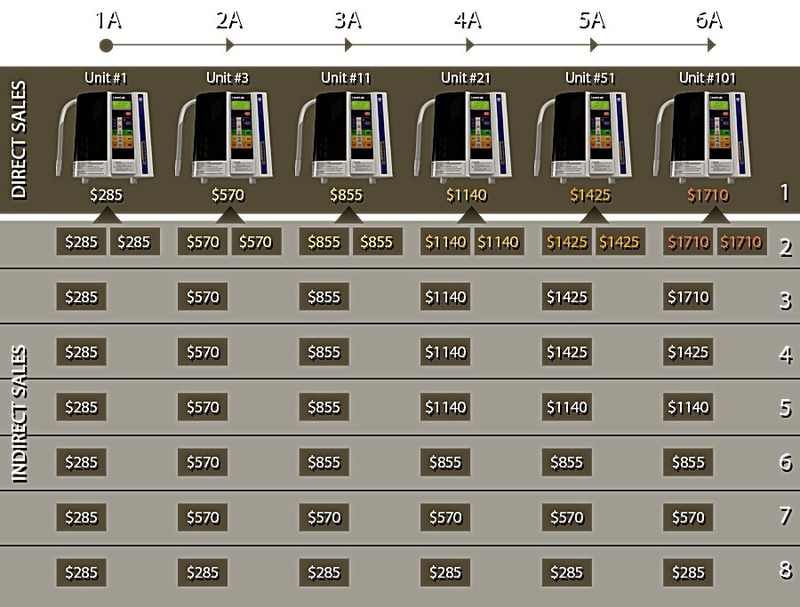 No matter how critical one is of the Gates hegemony, this is smart business. It might sound weak kneed but business is for making money. China is not exactly a Civil Rights stalwart; however it is a sovereign nation that calls the shots within its own borders. 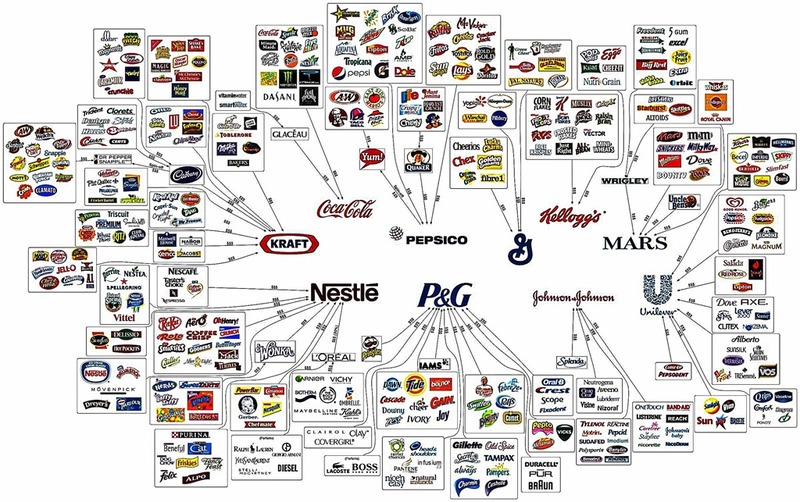 If the last bastion of huge Communism is making Capitalistic deals their society is transforming albeit all so slowly. The Capitalistic bottom line: It is China’s sovereignty and it is Bill’s property and money. Capitalistic globalization moves on. Tracked back to Slantright.com. LISBON (Reuters) – Microsoft has pledged to create rules on how it will deal with government complaints about Web sites and blogs hosted by the U.S. software giant. Following concerns on how Microsoft pulled the blog of a critic of the Chinese government, Microsoft said that in the future it will only block access to diaries on its MSN Internet portal when it is presented with a court order or another legally binding decision. But the blog will only be banned in that particular country. "Going forward we will have a policy of removing access for the country where the blog was issued, but not outside that country," Brad Smith, Microsoft’s chief counsel, said at a Microsoft conference. Microsoft will find a technical solution to make sure the blog will still be viewable in other countries. "We want to formulate a new framework and new principles. Principles need to emerge," said Smith, adding that the need for clear guidelines became imperative after MSN took down the popular blog written by Zhao Jing last month. had received an order from the information authorities in Shanghai, which Microsoft found to have legal authority to decide what can be published in China. "That was one of the things that made us sit and think. (Now) it will be transparent what is happening and why," Smith said. Around 3.3 million bloggers in China publish their Web diaries on the Spaces pages of Microsoft’s MSN service. Microsoft is not the only company struggling with China’s censorship rules. Last month the country’s propaganda chiefs closed the outspoken supplement Freezing Point of respected newspaper China Youth Daily, and Web search leader Google announced restrictions on a new service for China to avoid confrontation with Beijing.